Okay! Some of this information is gonna be a little confusing. I have some great visuals, an animated slide show(it's kinda small, though), and a brand new rumors section. Please enjoy! Who is Sailor Cosmos? That is a good question.And the answer is VERY confusing.Sailor Cosmos IS Chibi Chibi,but she is also Sailor Moon.In the far future, some strange disaster occurs causing Neo Queen Serenity, who had long ago given up her senshi powers, to become Sailor Cosmos. Chaos awakens and a war breaks loose, causing the deaths of all the Sailor Senshi besides Cosmos. She often thought back to her battle with Galaxia at the Galaxy Cauldron. She regretted not destroying the Galaxy Cauldren, so Cosmos went back in time to help Eternal Sailor Moon make the right choice. But she couldn't just go back in senshi form because all the new senshi were turning out to be enemies.What better form to go back as than a sweet little girl who falls from the sky? Sound familiar? Doesn't that just SCREAM Chibiusa? Chibi Chibi also seems to know just how Usagi is feeling at the time and how to help. How does Chibi Chibi meet the scouts? Chibi Chibi falls out of the sky much like Chibiusa except instead of Luna P, Chibi Chibi has a parasol. (hence the name of my site^-^) Chibi Chibi appears in the beginning of the Sailor Stars. She comes after Mamoru's starseed has been taken(in the anime and manga),so when she comes Usagi is in a lot of pain.She demenstrates having special powers like being able to hypnitize Usagi's family into thinking that she is her sister. She can also transform into Sailor Chibi Chibi Moon. Chibi Chibi appears to be about 2-3 in age. Normally, she can only say,"Chibi Chibi,",but can mimic the last few words of a sentence if asked a question. 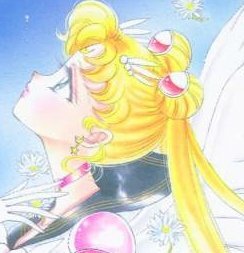 Chibi Chibi resembles both Chibiusa and Usagi,but little is known about her until the end of the Sailor Stars, manga or anime. What's the difference between Sailor Moon and Sailor Cosmos? This is also a good question because there isn't much different about the two scouts.In my opinion,the most noticible and decieving difference is the hair buns.Sailor Moon wears her hair in a "meatball" or circular style.While Cosmos sports a heart-shaped style. The uniforms are also different.Another decieving difference is the scout name.When I first heard of "Sailor Cosmos" I thought she was a new Sailor Asteroid or something.One last difference is their markings.Sailor Moon has a moon on her forehead.Sailor Cosmos has a pure heart crystal-shaped sign on her forehead.Otherwise, Sailor Moon and Sailor Cosmos are exactly the same person in different periods in time.Compare the pics of Cosmos and Sailor Moon below to see some differences. The story is quite different in the anime. In the anime Chibi Chibi falls from the sky,umbrella in hand,hypnotizes Usagi's mom,blah blah blah..and blah. Here's where the story gets different.In the last episode, Eternal Sailor Moon and Chibi Chibi Moon are the only two battleing Galaxia. When Galaxia steals Sailor Moon's starseed Chibi Chibi starts praying. Her praying makes Sailor Moon's starseed return. Sailor Moon is near death and can only see Chibi Chibi blurrely when she trnasforms into Sailor Cosmos. Chibi Chibi,now Sailor Cosmos says something like this," I am the light of hope in Sailor Galaxia's starseed. Use this sword to destroy her now!" Then Cosmos changes into a sword to destroy Galaxia! 1. Chibi Chibi is Saior Moon's second daughter. -There is no truth in that--at all! The subject that Chibi Chibi may be Usagi's daughter does come up in the Sailor Stars (manga version),but that is not right. There is only one child per millenium and that is Chibiusa. 2. Chibi Chibi is Sailor Moon's sister. -Nope! Wrong! If you believed that then perhaps the spinning parasol trick does work. Chibi Chibi poses as Usagi's sister. Usagi's only sibling is Shingo (Sammy). 3. Chibi Chibi is Chibiusa's daughter. -This is brought up briefly in the Stars, but never confirmed. 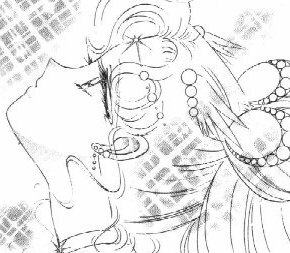 In the manga translation Chibiusa realizes almost instantainiously that Chibi Chibi is not her daughter. 4.Chibi Chibi is Sailor Kakyuu's daughter. -This is never brought up and I'm not really even sure how this rumor came to be. Chibi Chibi saves Kakyuu at one time and keeps her in an insense burner. She is special to Kakyuu, but she is not her daughter. 5. Chibi Chibi is Galaxia's daughter. -This rumor makes a bit more sense than the last one. It leads to the next rumor. This is not true either. -This is true. In the anime Chibi Chibi is Galaxia's star seed, which she sent away for someone to nuture. Chibi Chibi is drawn to Usagi's power and care. This is probably where the previous rumor came from. -This is not true. Sailor Cosmos altered her form purposely to appear innocent and not to pose as a threat. Sailor Cosmos is Sailor Moon. -This is a debated rumor. In my opinion, I think it is false. At one point while talking to the Amazoness Quartet (Chibiusa's scout team) Sailor Juno asks if Cosmos is their Princess. Cosmos replies, saying that their princess will be reborn as the others have. I have posted a picture below that probably started this rumor. Also, that pic shouldn't have anything to do with Chibiusa. The little girl is Chibi Chibi! Okay!This is the mistakes section.I've found mistakes in the manga that make Cosmos' story kinda messed up.I'm not saying Naoko did a bad job writing Sailor Moon but these things can't go unknown and unexplained.Here we go.First, earlier in the series Naoko states that both forms of Sailor Moon can't be in the same place at the same time or history could change coarse.Either Cosmos has the power to become a COMPLETEY different person or that rule was majorly broken.Also Cosmos is seen with Sailor Moon in many pictures meaning that not just Chibi Chibi, but Cosmos as well,came in contact with Sailor Moon.Next,Cosmos NEVER actually states she is Sailor Moon's ultimate form.She only says she is a coward.Cosmos also says she is no match for Eternal Sailor Moon's confidence and power.How can that be if Cosmos is Sailor Moon's ultimate form?Also, at times the manga has said Eternal Sailor Moon is Sailor Moon's ultimate form.Sailor Moon has always kept the "moon" part of her name when she got stronger.Why change it now? Sailor Moon always kept her hair the same,even in the past it was the same.Why would she change her hair? Many of the questions asked here cannot be answered.I wish I could answer most of them but I can't.At least I could introduce these questions.What do you think? I normally don't get feedback but when I do,I really enjoy it.This is for your comments on the loopholes section.Please send them in!The text marked with *'s are quotes from my loopholes section.Now for some comments by Kitten of the Moon! series "you can't be in you past life or your future life at the same time." odangos and chibi chibi has hearts. chibi chibi is the true sailor moon." are very wrong! i only saw one site that has the information on her correct." chibi chibi. this really clears things up on her." site! lol you have no use for it now. I dunno about you fanners, but I found that,all in all, very confusing. I'd like to speak to Naoko herself, but wouldn't all Sailor Moon fans. Tee hee. N-e-way, thanks for the comments Sailor Chibi Cosmos. (I've been emailed tons of times bye Sailor Chibi Cosmoses, but never a "Chibi Cosmos". YAY! I'm unique!) Well, moonies, keep in mind that I absolutely love comments and questions. Thanks!